The following HTML version was converted via Google docs OCR with corrections to the translation by David Carlisle for this site, made available under the same Creative Commons licence. Robert Jones is both an interesting and a puzzling person. He was an intimate friend of William Wordsworth from their University days at St John’s College, Cambridge. Joxes was athletic, friendly, affable and good company; he was the companion of Wordsworth on his three thousand mile walking tour through Europe in 1791. During his adult life he and the Wordsworths repeatedly visited one another and he accompanied them on several tours through Wales, but as the years wet by he became overweight and out of condition, withdrawn but constant in his friendship and love for William as was William in his regard for Jones. From the onset of has appointment lo the church of St Mary, Souldern, Jones did is best to delay actually setting there, offering one reason after another to the Bishop of Oxford as to why he should have leave of absence, managing to spend almost half of his tenure away from his parish. During the thirteen years he actuall spent in Soulden he ran up a massive debt and the Bishop in 1822 Was obliged to allow Robert to retire to Wales leavig the cure of Souldern in a curates’s hands. Eventually the Bishop had to involve the civil athorities to deal with monetary issues while Robert, still in name Rector of St Mary’s, continued to live comfortably at his family home in Wales. In 1622 Dr John Williams, Bishop of Lincoln, bestowed a substantial endowment upon St John’s College, Cambridge. He had already founded four scholarships and two fellowships in Westminster school, two of which were for persons born in Wales; he now founded four scholarships and two fellowships in St John’s College, Cambridge for the further advancement of these scholars. He then purchased lands and the perpetual donation and patronage of four benefices, one of which was the cure of Souldern.1 To these benefices the holders of his fellowships were in due course to be presented. And so it came about that in 1806 Robert Jones, Fellow of St John’s, was presented to the Church of Souldern. 1 W Blomfield, History of the Deanery Bicester, part VII. History of Fritwell and Souldern (London, 1882) (henceforth DB), 71. 2 Juliet Barker, Wordsworth, A life (henceforth WL), 68. 8 K.R.Johnson, The Hidden Wordsworth, 192. They lived frugally and travelled light, and thirty years later Robert recalls ‘We were early risers in 1790 and generally walker 12 or 15 miles before breakfast and after feasting on the morning Landscape how we afterwards feasted on our Dejeuner of whatever the house might afford’.11. The whole escapade was a remarkable achievement showing great courage and stamina, both physical and mental and it made a very strong bond between the pair. Twenty-five years later Jones declared to Wordsworth ‘I can assure you that a Day seldom passes that I do not think of you with feelings of inexpressibile affection’.12 Wordsworth, who had, with great feeling dedicated his work, Descriptive Sketches (which recounted their memorable tour), to Robert,13 was equally fond of him; their friendship was to endure until Robert’s death in 1835. 12 Stephen Gill, Wordsworth, A Life (1989), 44. 13 Descriptive Sketches in W. Wordsworth, Poetical Works, ed. T.Hutchinson (Oxford, 1981), 469 (henceforth PW). By the middle of October they were both back at Cambridge, with only a few short months left to prepare for their degree examination. 15 ‘Deceased Clergy’, Gentleman’s Magazine, June 1835. 18 Kenneth R. Johnson, The Hidden Wordsworth, 264. 20 WLL 14. See Letters of Dorothy Wordsworth, ed A. G.. Hill (Oxford, 1985), 168 for the complete letter. 22 The Prelude 14 in PW, 583f; Ibid. 6 in PW, 536. 24 WLL 24–5l WL 130–1..
25 Dorothy Wordsworth, The Grasmere Journal (1987), 42, 43. Blomfield mistakenly suggests that Robert went abroad again with Wordsworth in 1802.26 But Blomfield had based his supposition on the sonnet Wordsworth wrote on that occasion which, though addressed to Jones, was referring not to Wordsworth’s current journey from Calais to Ardres but to that other one in 1790. Went pacing side by side this public way. Streamed with the pomp of a too credulous day. Wordsworth is referring of course to Bastille Day, July, 1790. 27 Sonnets Dedicated to National Independence & Liberty III in PW, 241. 30 Oxfordshire Record Office, MS Oxf. Dioc, (henceforth OD) c.658 la. 33 W. Wing, Appendix to Antiquities of Steeple Aston, N. Oxf. Arch. Soc. Trans. xxii (1887). 34 OD c. 658 2. 35 OD c. 658 3. 36 OD c. 658 4. 37 Diana McClatchey, Oxfordshire Clergy 1777–1869 (Oxford, 1960), 30–8. 38 OD c. 658 56. 39 OD c. 658 55. 41 OD c. 658 57. According to a terrier of 1638 the dwelling house at that time was ‘new built, with two Barnes and a stable in good repair’. 43 Oxfordshire Record Office, M.S.Oxon, Archd. papers c.102 Churchwardens’ Presentments. 44 OD c. 658 59. 45 OD c. 658 60. 46 OD c. 658 59. 47 OD c. 658 61. 48 Oxfordshore Record Office MS. d.d. Par. Souldern b.13 item d.
Fig 1. Souldern Parsonage. DB, plate after p.98. He continues with a description of his ideal, a parsonage house generally stands not far from the church this proximity imposes favourable restraints, and sometimes suggests an affecting union of the accommodations and elegancies of life with outward signs of piety and mortality’. Fig. 2. 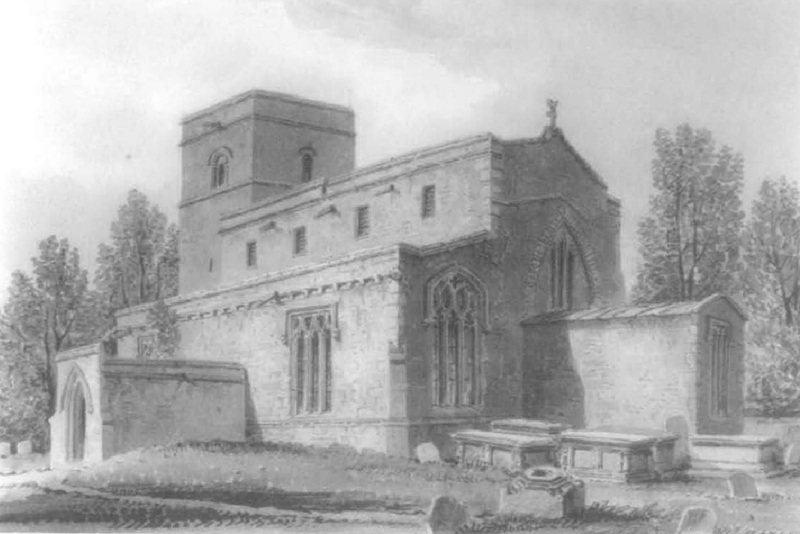 South-east view of the church in 1823, by J. Buckler. Bodl. MS Top. Oxon. a 68, f. 484. 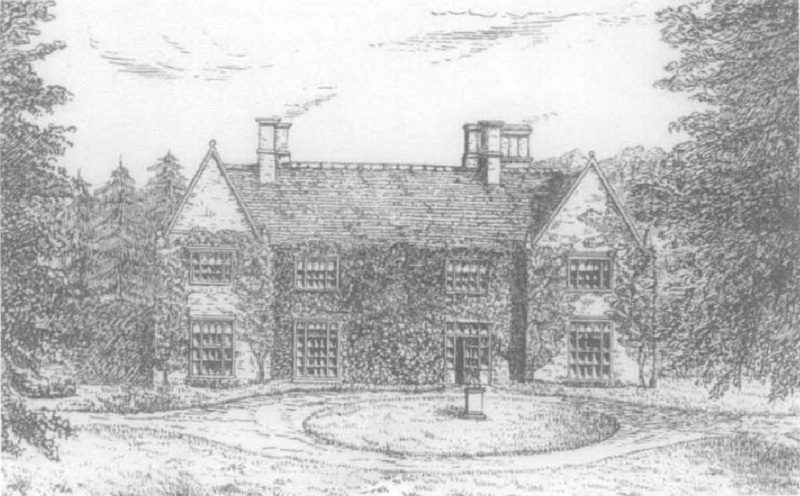 He added: “The precincts of an old residence must be treated by ecclesiastics with respect both from prudence and necessity’.49 Possibly influenced by this view Robert proceeded to spend the money raised by improving the south front rather than making interior changes.50 The terrier of 1811 describes the house as slated, with a dairy adjoining and two thatched stables and a pleasure ground in front of the house. A barn of two bays and a Cowhouse, both thatcher, were built by Jones in 1810 as were tanslated necessaries and a stone walled garden for fruit trees on the north, extending from the north-east to the northwest, which with an already existing orchard and nursery for trees comprised two acres of land; furthermore there also existed the daily round paddock a spinney and an established pond all together extending over more than three acres. 51 DB 95 (Terrier of 1811). How much all this cost is not known; the original amount horrowed was £662 6s. 10d.52 a strangely precise amount; later Jones was to explain his mounting debts on these improvements. 52 OD c. 435, 32–6. 54 OD c. 429 f.130. Wordsworth was impressed by Robert’s dwelling which so dcosely exemplified his own views on how a parsonage should look, and while there composed a sonnet entitled A Parsonage in Oxfordshire in which he comments in a philosophical manner on the absence of a dividing wall or boundary between the churchyard (Fig. 2) and his friend’s garden.56 In later years he recalled the visit: ‘With pleasure I recall... the residence of an old and much-valued friend in Oxfordshire. The house and church stand parallel to each other, at a small distance a circular lawn or rather grass-plot spreads between them; shrubs and trees curve from each side of the dwelling, veiling, but not hiding, the church. From the front of this dwelling, no part of the burial-ground is seen, but as you wind by the side of the shrubs towards the steeple-end of the church, the eye catches a single, small low, monumental headstone, moss-grown, sinking into and gently inclining towards the earth. Advance, and the churchyard, populous and with glittering tombstones, opens up on the view.’57 This visit in 1820 was the only time that Wordsworth came to Souldern, all other meetings between the two friends took place elsewhere. 56 Miscellaneous Sonnets VII in PW, 215. 58 OD c. 429 130. 59 OD c. 658 57. 60 OD c. 429 130. When in 1808 he had been granted permission to raise the necessary money he had considered a little over £600 to be sufficient. An indenture had been drawn up between him and Henry Churchill of Deddington for a loan to Robert of £662 6s.10d. to be repaid at a rate of £5 10s. 0d. per centum if Robert continued to reside in Souldern or £10 0s. 0d. per centum if he did not.61 He had had 13 years to repay and according to him a gross income of £500,62 though in an earlier letter he had put his income at £613 gross and £500 net63) His debts now mounted to over £3,00064 an enormous sum even if he had under-estimated the cost of all his rebuilding. 61 OD c 435 32–6. 62 OD c. 428 130. 63 OD c. 658 61. For the full text of the mortgage see OD c. 2092 137–9. 64 OD c. 2261 item j. 65 OD c. 429 131. 67 OD c. 2261 item j: Halsbury’s Laws of England, Ecclesiastical Law. 68 OD c. 2261 item j: Halsbury’s Laws of England, Ecclesiastical Law. By June 1822 Robert had become an absentee Rector and had settled comfortably in Wales. Evidently his ‘inconsiderable landed property’ being entailed69 was safe from the creditors he had left behind. 69 OD c. 658 61. Robert still managed to get into financial difficulties, in 1825 Dorothy Wordsworth had the unpleasant duty of writing to Robert about a sum of money owed to her brother, though she softened the request, by implicitly inviting him to Rydal Mount again. 72 Letters of Dorothy Wordsworth, ed A. G. Hill (Oxford, 1995), 168. 73 WLL 177; Letters of Dorothy Wordsworth, ed A. G. Hill (Oxford, 1995), 168n. 74 W. Wordsworth, The Prelude: The 1805 Text, ed Ernest de Selincourt (Oxford), 275n. 75 Stephen Gill, W. Wordsworth, a Life (1989), 351; WL 587. 77 W. Wordsworth, The Prelude: The 1805 Text, ed Ernest de Selincourt (Oxford), 275n. Robert was still in name Rector of Souldern; licences for non-residence subsequent to the one issued for June 1822 to December 1823 are either not extant or were never issued; however licences do exist spanning the years from March 1831 to 1836, the last issued in March 1835 just a month before Robert’s death.79 It would seem that he lived more or less permanently in Wales leaving the care of the parish to others. 79 OD d 174; Oxfordshire Record Office MS Oxf. Archd. Papers b.26 f.394; Ibid, b.51 f.44; OD d.17. 80 ‘Deceased Clergy’, Gentleman’s Magazine, June 1835. Could pierce through a temper that’s soft to disease. Would be rational peace – a philosopher’s ease. Of shame scarcely seeming to know that she’s there. Such an odd, such a kind happy creature, as he. 83 Poems of Sentiment and Reflection IV in PW, 378. I would like to thank the Acting Editor and Dr. Kate Tiller for their advice and encouragement, and I am also grateful to Susannah Meadway, Barrister, for her explanation of sequestration orders and other aspects of ecclesiastical law.